Chapter 1. 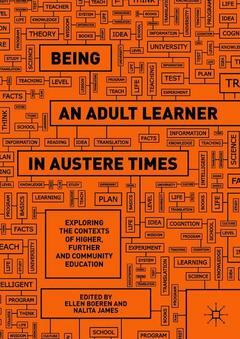 Adult education in austere times: an introduction; Nalita James and Ellen Boeren.- Chapter 2. Being an adult learner in Europe and the UK: persisting inequalities and the role of the welfare state; Ellen Boeren.- Chapter 3. The message or the bottle? Community, associationism and adult learning as "part of the process of social change"; Sharon Clancy.- Chapter 4. Keeping going in austere times: the declining spaces for adult widening participation in HE in England; Lindsey Fraser and Kerry Harman.- Chapter 5. Mature Students and Social Isolation: being excluded or choosing to be alone? ; Charlotte Sutton.- Chapter 6. Subjects in formation: women's experiences of Access to Higher Education courses and entering Higher Education; Sherene Meir.- Chapter 7. Further educations: transformative teaching and learning for adults in times of austerity; Vicky Duckworth and Rob Smith.- Chapter 8. Adult education in community organisations supporting homeless adults: exploring the impact of austerity politics; Katy Jones.- Chapter 9. Conclusions and recommendations; Ellen Boeren and Nalita James. Ellen Boeren is Reader in the Moray House School of Education at the University of Edinburgh, UK. A prize-winning author and researcher, she is also co-editor of UNESCO’s Fourth Global Report on Adult Learning and Education, and is currently involved in the Horizon 2020 project Encouraging Lifelong Learning for an Inclusive and Vibrant Europe. Nalita James is Associate Professor in the School of Education at the University of Leicester, UK. Her research interests centre in the sociology of education, encompassing access to higher education, the changing patterns of education, and adult education and lifelong learning.